Grow seedlings grow! I'm counting on you. You can do it! Does it help to give the little seeds a pep talk? I don't know, but I'm going to try. Today I planted my Burpee Seed Starting Kit with tomato seeds. 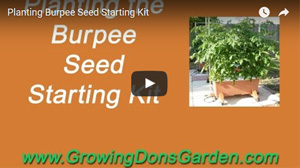 You can learn more about what I bought and why by checking out the previous blog post on the "Burpee Seed Starting System". I'm hoping that my tomato seedlings are ready by March 1. Let's hope I did things right and all goes well. My goal is to get them planted in the Earthbox by the first of March so that they have a full 70 days to mature before the sun starts beating down hard on them here in Central Florida. After I got this done, I ran across the video on the Burpee website about how to set these up. Of course, the link on the box just went to a page that didn't exist and I missed the actual video on their website when I looked earlier. One would think that the link would be correct or if it changed, that somehow they might let you know about it. Obviously, I ask for too much! Outside of the lid not seeming like it fit on well, I kind of struggled to orient this black grow mat in the tray. It wasn't real clear how to do it from the box. While the pellets expanded, they didn't seem to expand as much as in the Burpee video. So, I'm not sure what I did wrong or what happened. I was a little unsure of how much water to put in the tray and that could be a little better communicated or maybe an easier way to fill it with markings that you could easily see. The other thing I was unsure on was whether to break the pellets up like I did, or leave them intact. Again, all things that Burpee could do a much better job in detailing or sharing. Here's the link to Burpee's video just in case you want to see it so you've got a better idea than I did when I started out putting this together. Regardless, make sure you check out my video below. I'll keep updating the progress of my tomato seeds and hopefully there will be something to transplant when they are done! Please let me know if you've tried this system and I always will take any words of wisdom in gardening. I love to learn, so feel free to comment on the video or this blog post!